Big Fat Indian Weddings will never cease to impress us! The larger-than-life wedding stage décor, gorgeous lehengas and lighting set ups that could give a Bollywood movie a run for its money! Well, Gaurav and Khushboo’s destination wedding held at Ramoji Film City, Hyderabad was exactly that. Loads of music, dancing, secret meetings and buckets full of love. We kid you not, this arranged-turned-love marriage of Gaurav and Khushboo took us straight back to the wedding times in Band Baaja Baarat. A wedding whipped up by Wedding Planners, Bling Mushrooms that did its wedding venue full justice! Right from the Punjabi themed mehndi with a personalized photo booth to the reception where Khushboo stunned us all in a red and navy toned Rohit Bal bridal lehenga, this Hyderabad wedding was a colourful wonder. PixelStory.in captured this Big Fat Indian wedding in all its grandiose and glamour. What to look out for as your scroll through this destination wedding held at Ramoji Film City, Hyderabad – the stunning lighting of the wedding, the wedding band in crystal dangling umbrellas and Khushboo’s stunning chaddar embellished with lights! 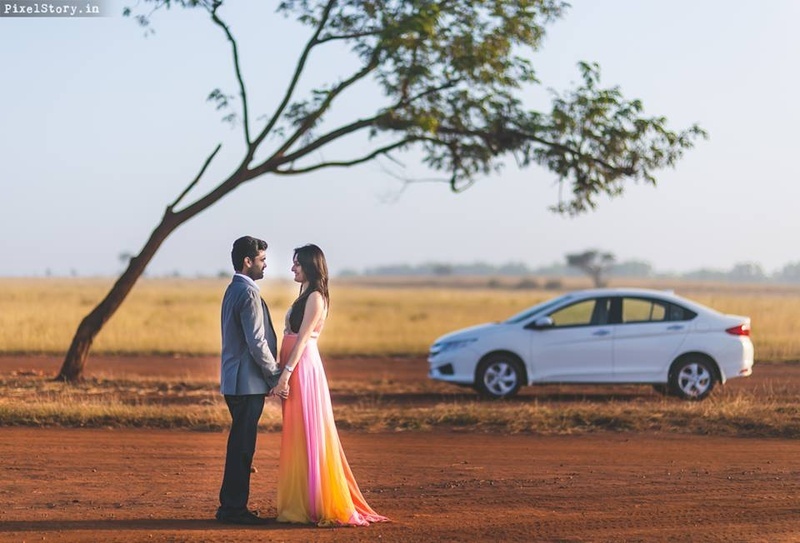 Khushboo and Gaurav’s pre-wedding shoot held at a serene, secluded location ensured that the wedding started off with just the right amount of romance. Khushboo was captured in a pastel coloured, ombre-dyed floor-length gown while Gaurav kept it classic by complimenting her in achromatic formals and a grey blazer to match. Post this, they had a lovely informal pre-wedding engagement party held at Taj West End, Bangalore. The following days consisted of the many ceremonies that a Marwari wedding adheres to. After all this was done with the dhoom dhamaka that every Indian function rightfully demands, they proceeded on to the Mehndi function. Khushboo wanted the best of all the fun, food, colour and music and thanks to the guys at Bling Mushrooms, her wish was granted. She picked out a red and beige Patiala set under a mirror-worked coatie by Mehak Chawla. She topped off her look with a matching parandhi, doing justice to the Punjabi theme that she went for. Gaurav himself looked quite dapper in a clean-cut bandhgala-chooridar set, choosing to colour co-ordinate with his bride-to-be. The most fun part at any wedding was held later that evening at the same location. The Sangeet at Ramoji Fim City, Hyderabad, witnessed a surprise flash mob by the bride’s friends who stood up to dance to Lungi Dance while the bride and groom entered the venue with a hard-core Punjabi number to balance out the mood. Not once did Khushboo’s smile slip, as she twirled the night away in a pretty peach gown adorned with floral silver-grey embroidery by Dolly J, Delhi. Her sparkling jewellery set seemed to add half the glitz and glam to the fun-filled night. One thing we love about this couple is their eye for aesthetics. Gaurav perfectly complimented Khushboo by arriving in a navy blue Canali nawab jacket with grey breeches. After all of this, the big day was finally upon them. Once again, the Haldi ceremony saw this cute couple matching their clothing, choosing to wear an appropriate haldi yellow saree and kurta. The joy that they evidently contained seemed to be contagious and seeped out into the air, leaving its victims with a more than just a smile. As the sun went down and the lights went up, Ramoji Film City resembled a luminous, colourful beacon of pink, green and gold. 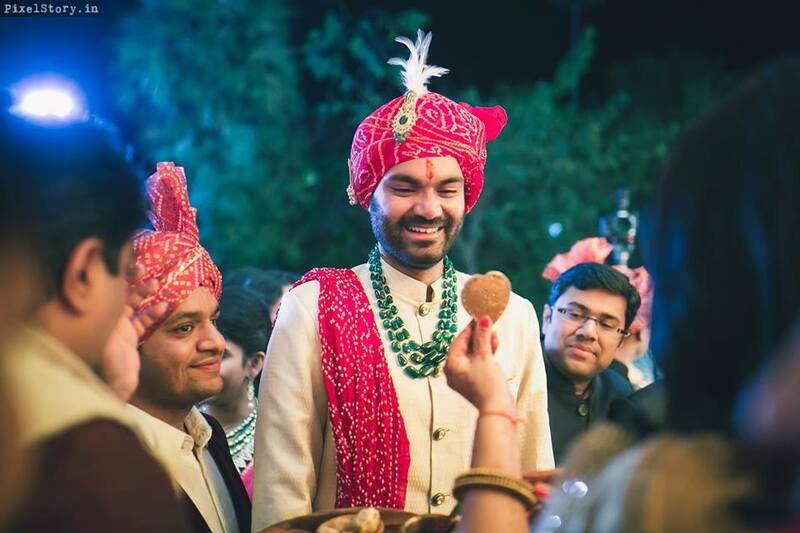 The groom regally arrived with his full-blown baraati party in a cream bandhgala sherwani by Akash Lohani and a red, bandhani print dupatta along with a matching safa. He pulled off the look effortlessly, accessorizing with a jade-green stone neckpiece. The bride hersef look gorgeous in a Rohit Bal lehenga in carrot pink embellished with Zardozi embroidery and navy blue scallops. The wedding affair soon concluded and Khushboo couldn’t help but tear up at her Vidai as she bid a heart-felt, emotional goodbye to her family. The day came to a close but dawn wasn’t too far, bringing in a new day and new emotions. Of course, Khushboo knew that her goodbyes aren’t forever and was back to her usual, happy self, enjoying the Pag-Pakdai and the post-wedding games along with her recently acquired partner-for-life and her trade-mark smile!